After checking major sport league and team customers` traffic statistics we have found out that from 30% to 60% of site visitors are using mobile devices. What is more, the number of such visitors is only growing day by day. That was a good reason for our team to start thinking of how JoomSport data is delivered to end users phones. Is access from mobile easy? Would it be enough to use responsive design or we need to improve and do something else? After many discussions, we have come to agreement that the best solution would be Sport Mobile Application. Have you ever dreamt of having Sport Mobile App for your league or sport club? Up-to-date functional mobile application that will include full sport statistic and even news feed about your major events? Nowadays many sport leagues and teams are ordering Mobile Application development from different software development companies. Unfortunately, very often final result is far from perfect in terms of functionality, structure, design and (most important!) quality. The price for developing sport Mobile App with very basic functionality and statistic delivery might start from $10'000 and can go as high as $30’000 – 50’000! Impressive, right? But don`t lose your hope on getting your own Sport Mobile App! We have something to offer. As a result of our eight years` experience in sport software development we have worked out our own exceptional way to create sport mobile applications at a very competitive price and with low development risk. We are happy to present http://app.joomsport.com service that allows you to get a Sport Mobile App with ready-made blocks right now! Imagine that you need to quickly check the information about your team or a game using any mobile device. It is not very convenient to use Web browser on mobile device as you have to always remember the site address. Mobile application solves this problem for sure. You can simply install your favorite league App once and always have easy and up-to-date access to all the information you need. Another advantage of JoomSport App is customizable notifications. Your users will be able to select only teams they would like to follow. Once any of these teams plays a match, all details about this will be immediately shown in App notifications! Updates about game results will be coming throughout the whole league season. JoomSport Mobile sport App has both Android and iOS versions, so all users can enjoy personalized approach. What are the main advantages and disadvantages of ordering JoomSport Mobile App instead of developing App from scratch? For us preparing a complete sport league statistic solution for both Android and iOS versions will take from one to two weeks! You won`t need to waste your time on creating new design, app development and delivery stages. We have already done that for you. Your Application has already been created. Basically all we need to do is to deliver it! The process is very simple and we are going to help you at every stage. 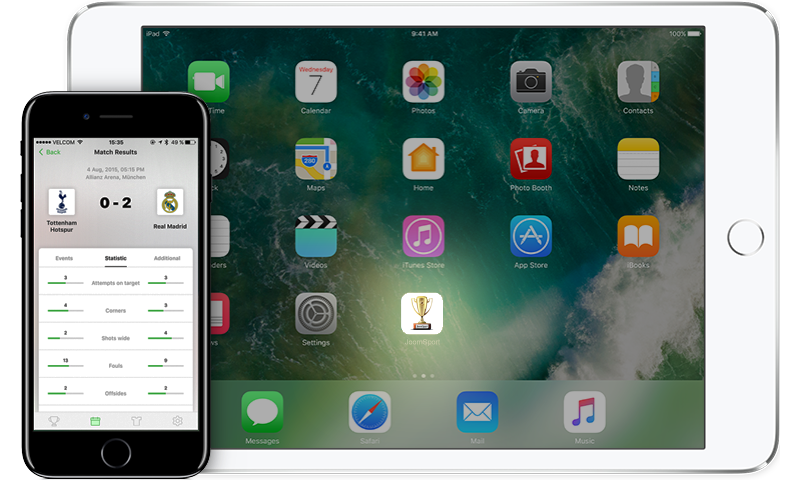 Our team will gladly walk you through the process of ordering Apple and Google marketplace accounts, choosing App icons and finally connecting your App code to your JoomSport database. Yes, you got it right - as simple as that! Ordering App from us will save you a huge amount of investments you would need to spend on the traditional full cycle development. Proper sport app from any trustworthy development company will cost you around 10 000 - 20 000 dollars depending on functionality. The price of our App is 10-20 times lower! Sounds like a good deal, huh? Our solution has only one disadvantage: your App will have a pre-defined structure following our JoomSport core solution structure. However, even this limitation is customizable and we can remove or add any kind of functionality that you might require at a very reasonable cost. Step number 1. Set up your sport data in JoomSport and then send a request for Mobile App delivery. From the technical point of view it would be significantly easier to roll out Mobile App using JoomSport data as far as it has the entire required API integrated. Step number 2. Purchase marketplace development accounts from Apple and Google. Of course, you can skip buying these accounts and publish your app under our development accounts. However, if you would like to have the App delivered under your name, you will need to create your own account that would let users be sure that App is official. Step number 3. Get your app delivered in accordance with the pricing plan! The App will be integrated with your site sport data, come under your name and have your branded logos. Contact us to order your Sport Mobile App! Can you modify mobile sport App for me personally and add some extra functionality? Sure! We will be glad to offer you any modifications based on our $50/hour rate. Please contact us in order to request the estimate. I don't use JoomSport for managing my games. Can you integrate your Mobile App with my custom sport database? Yes, we can do that. The pricing is specified in our custom development pricing plan. Please contact us to check if we will be able to complete such integration within the offered price. Will there be any mention of BearDev development company in my App? No, we are not going to add it unless you request us to do so. The App will be distributed under your brand name only. How much the App support cost and what will be included in the price? One year of free App support is included into the development cost. After that we will provide annual support for 30% of the initial price. For example, if you select our regular plan, annual support will cost you $298 per year. The service includes delivering public App updates and notifications service. Which infrastructure is used to deliver notifications to the end users? We use reliable and 100% secure Amazon services to deliver notifications about your games.